Brutal Brockmire is back for a second inning. Season two of the Brockmire TV show premieres on IFC, Wednesday, April 25, 2018 at 10:00pm ET/PT. The second season picks up a year after the season one finale (Note: the press release, below, lists the correct date, but incorrect day of the week). An IFC scripted comedy, Brockmire stars Hank Azaria as hard luck sports announcer, Jim Brockmire. The cast also includes Amanda Peet, and Tyrel Jackson Williams. Carrie Preston, Becky Ann Baker, Dreama Walker, Utkarsh Ambudkar, and returnees Katie Finneran, and Hemky Madera guest star in season two. Check out this IFC press release for more about the second season of Brockmire. LOS ANGELES – January 12, 2018 – IFC’s critically acclaimed comedy Brockmire is returning for its second season on Thursday, April 25 at 10PM. 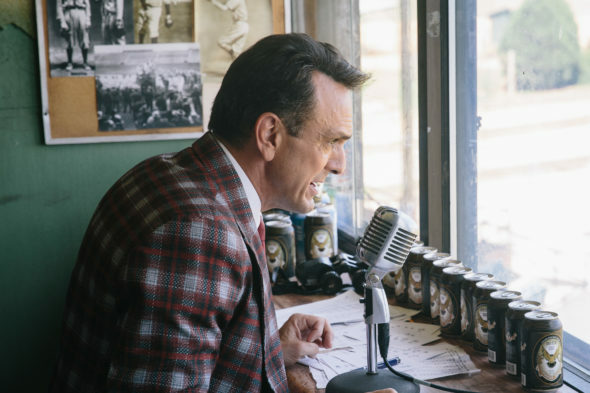 Starring Critics’ Choice Awards nominee Hank Azaria (The Simpsons) as Jim Brockmire, the boozy baseball announcer trying to make a comeback in the major leagues, Brockmire is produced by Funny Or Die and written and developed by Joel Church-Cooper (Undateable). Returning to star alongside Azaria are Tyrel Jackson Williams (Lab Rats) and Amanda Peet (Togetherness). Season 2 will consist of eight episodes, airing weekly on Thursday nights. Brockmire follows Jim Brockmire, a famed major league baseball announcer who suffered a notorious public breakdown after stumbling upon his wife’s infidelity – a breakdown so bad that “Brutal Brockmire” became a viral internet meme. Season 1 began a decade later, as Brockmire looked to reclaim his career, reputation, and love life. He eventually found happiness calling games for the Morristown Frackers, the underdog minor league baseball team, alongside his girlfriend Jules (Peet). Now one year following the Season 1 finale, which found Brockmire chasing an opportunity to call games in New Orleans, (and leaving Jules behind in the process,) he is a top podcaster with his show “Brock Bottom,” while living with his co-dependent friend Charles (Williams)…and boozing harder than ever. Still trying to still reclaim his career as a top sportscaster, Brockmire cannot resist the sinful temptations of the Big Easy, while pining for the girl he left behind in Morristown, PA and struggling to find his purpose in life. Season 2 guest stars include Carrie Preston (True Blood), Becky Ann Baker (Girls), Dreama Walker (Doubt), and Utkarsh Ambudkar (The Mindy Project). Katie Finneran (Bloodline) and Hemky Madera (Queen of the South) also return as Lucy Brockmire and Pedro Uribe, respectively. Brockmire originally appeared as a viral short video on the award-winning comedy website Funny Or Die. Season 2 is directed by Mo Marable and executive produced by Azaria, Church-Cooper, Marable, Tim Kirkby and Funny Or Die’s Mike Farah and Joe Farrell. Brockmire Season 1 is available to watch on iTunes, Google Play, Amazon and XBOX. What do you think? Are you a fan of the Brockmire TV series? Do you think you’ll check out season two on IFC? More about: Brockmire, Brockmire: canceled or renewed?, IFC TV shows: canceled or renewed? Brockmire: Is the IFC TV Show Cancelled or Renewed for Season Four? Brockmire: Is the IFC TV Series Cancelled or Renewed for Season Two?